As well as being in some financial difficulties Avietick Ter Stephanus conducted his personal life not as conventionally as we perhaps do today. His first wife having died, he then had a relationship with his Muslim slave girl with whom he had an illegitimate son Gabriel. She eventually converted and became a Christian and Avietick Ter Stephanus named his son as his natural and legitimate heir. There is a branch of the Stephanus/Harney stem from Dacca that is descended from Avietick Ter Stephanus and the slave and there are living descendants from this union all around the world. Is this so shocking? No, not really. There simply were not many female Armenians in India to marry Armenian men, so it was only natural for the men to take local native females as their brides/companions; they would naturally convert and be baptised Christian usually in the Armenian Church. 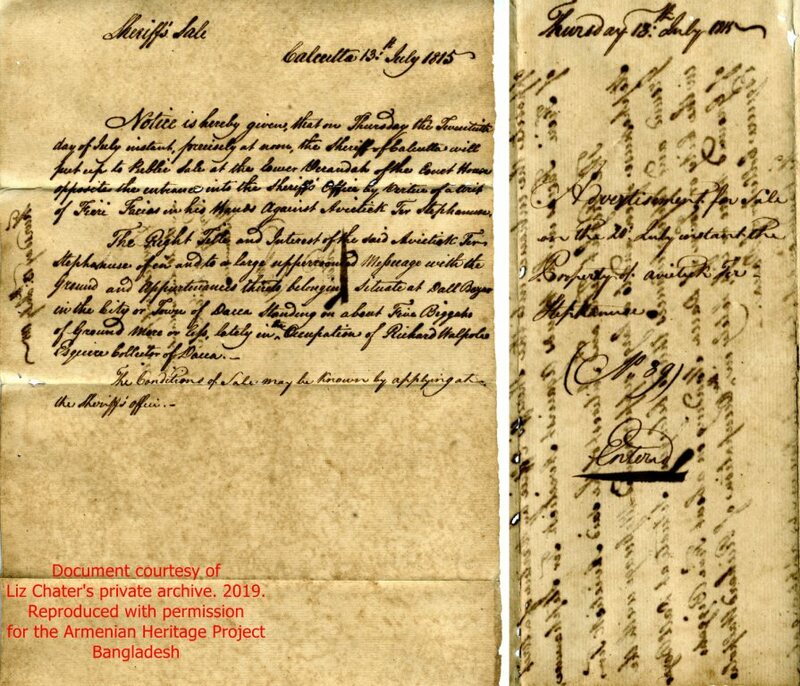 This document is an advertisement for the sale of a property belonging to Avietick Ter Stephanuse in Dacca. Notice is hereby given, that on Thursday the twentieth day of July instant, precisely at noon, the Sheriff of Calcutta will put up to Public Sale at the lower verandah of the Court House opposite the entrance into the sheriff’s office by virtue of a writ of Fieri Facias* in his hands against Avietick Ter Stephenuse. The right title and interest of the said Avietick Ter Stephanuse of in and to a large upperroomed messuage with the ground and appurtenances thereto belonging situate at Dall Bazar in the city or town of Dacca standing on about five Biggahs of ground more or less, lately in the occupation of Richard Walpole Esquire Collector or Dacca. The condition of sale may be known by applying at the Sheriff’s office. * A writ of execution authorizing a sheriff to lay a claim to and seize the goods and chattels of a debtor to fulfil a judgment against the debtor. Advertisement for sale on the 20th July instant the property of Avietick Ter Stephanuse. One William Harney, a Mutiny veteran, who had married an Armenian wife, has found a lasting resting place in that ancient cemetery [Dacca]. He was according to the inscription on his tombstone born at Belfast Ireland on the 23rd March 1830, and died at Dacca on the 16th July 1901. His grand daughter Zenobia, the wife of V.T. Stephen of Dacca, has erected the memorial over the grave of her “dear grandpa. So we know that William Harney was definitely Zenobia’s grandfather. Turning to the Dacca marriage register, entry No. 18 has the marriage of William Harney to Heripsima Gabriel Ter Stephanuse daughter of Gabriel Ter Stephanuse in January 1858. Gabriel Ter Stephanuse was the illegitimate son of Avietick Ter Stephanus and Takoee or Takoi (previous named Lukhee before conversion to Christianity). The illegitimacy was established in a court case where Avietick Ter Staphause’s will and estate was in question, part of the testimony in the court case states that Avietick Ter Stephanuse had fathered an illegitimate son with his Muslim slave girl (the above Takoee/Lukhee) but had subsequently recognised him legally and was therefore a legitimate son and heir. Gabriel was involved in a big court case where he apparently hatched a plan with his mother Takoi to fake his father’s will. My book “Armenian Graves and Inscriptions in Dacca” page 92 and P.132 has the charts and story in detail along with source references. There is a large amount of information contained in various law reports. If you can get hold of Indian Decisions (Old Series) the case is reported over several years in various volumes. Reports of cases heard and determined by the Judicial Committee …, Volume 6 By Great Britain. Privy Council. Judicial Committee, Edmund F. Moore.